Treats, Fun, & Games! Join the staff and volunteers of DeSoto State Park, National Park Service, JSU Field Schools, & the Conservation Education Institute for a weekend of fun events guaranteed to run shivers up and down your spine! Trick or treating, games, live animals, storytelling, and more are in store during this popular annual event. Grab your favorite costume, bring the family, and come stay with us! All events are free to the public and great for all ages. Call 256.997.5025 or the Spookapalooza website for details. 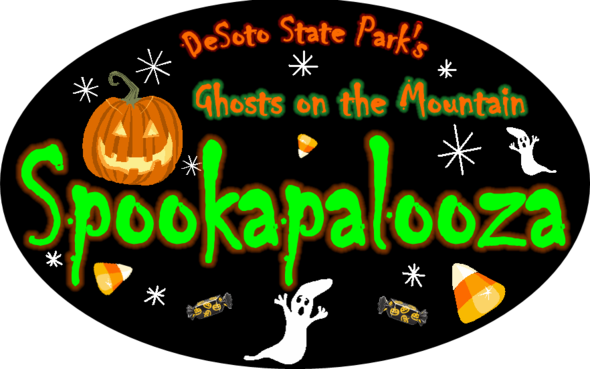 DeSoto State Park is glad to host the 5th Annual Spookapalooza Pumpkin Carving Contest! Entries will be judged on overall appearance, creativeness, neatness, and originality. 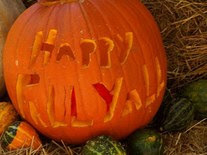 Entries can have any theme or design, i.e., Halloween, nature, fall season, etc. All ages may enter contest. Join storyteller Renee Simmons Raney, Director of Conservation (Georgia-Alabama Land Trust) & author of ‘Calico Ghosts’ for this fun program. 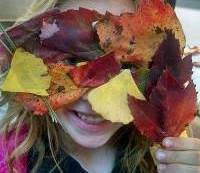 Renee will be telling the story of Brother Leaf and will be hosting a mask making activity for kids of all ages! Ever wonder whooo's going "hoot" in the night? Get better acquainted with everyone's favorite nighttime raptor with the Alabama Wildlife Center, Alabama's oldest and largest wildlife rehabilitation and education center. Learn what makes these captivating predators so unique, meet live owls up close, and much more! Vicky Beckham Smith of A-Z ANIMALS presents a fascinating program about those night creatures people either love or hate….Bats! Bring along the family to see Vicki’s live collection of bats! Join the staff and volunteers of DeSoto State Park, National Park Service, JSU Field Schools, the Conservation Education Institute & more for a great afternoon of fun & games; Pumpkin Decorating, bobbing for apples, moonbounces, slides, facepainting, rub-on tattoos, & more! Wear your favorite costume if you wish! Candy stations are located through-out the campground. Parents must accompany children at all times. Dress up your pets and bring them along! Join storyteller Renee Simmons Raney, Director of Conservation (Georgia-Alabama Land Trust) & author of ‘Calico Ghosts’ for a night of spooky stories guaranteed to put shivers up your spine! Learn about some of Alabama’s finest spooks, legends and folklore. Vicky Beckham Smith of A-Z ANIMALS presents a fascinating program about those night creatures people either love or hate….Bats! Bring along the family to see Vicki’s live collection of bats! Join Cheaha State Park Naturalist Mandy Pearson & CEI’s Renee Simmons Raney to discover some of the native creatures of Alabama (as well as non-natives) in this fun uncaged presentation. Meet some live critters!